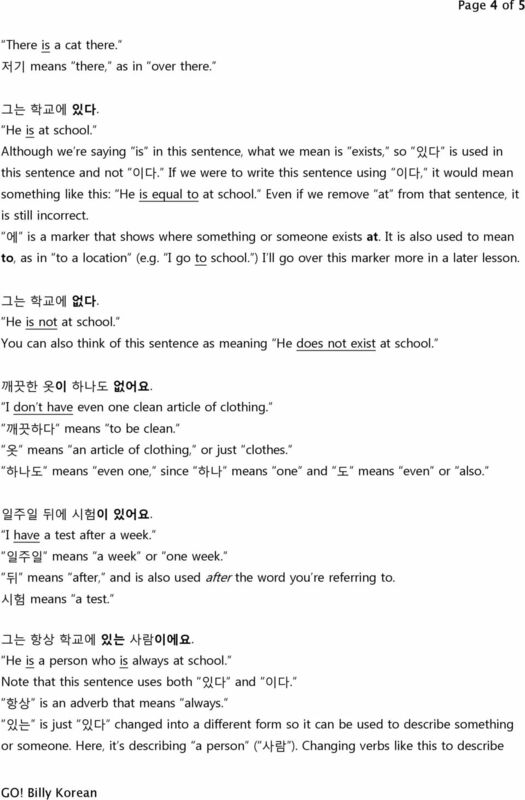 Download "Page 2 of 5 아니다 means to not be, and is therefore the opposite of 이다. While English simply turns words like to be or to exist negative by adding not, "
1 Page 1 of 5 Learn Korean Ep. 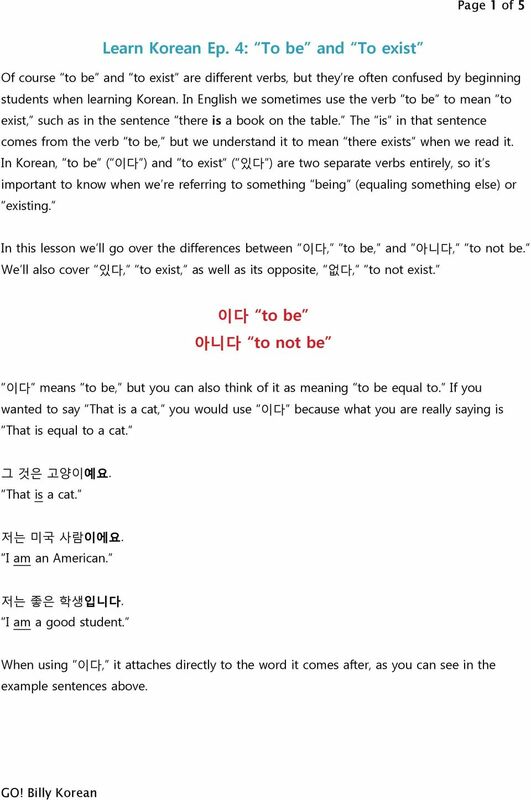 4: To be and To exist Of course to be and to exist are different verbs, but they re often confused by beginning students when learning Korean. In English we sometimes use the verb to be to mean to exist, such as in the sentence there is a book on the table. The is in that sentence comes from the verb to be, but we understand it to mean there exists when we read it. In Korean, to be ( 이다 ) and to exist ( 있다 ) are two separate verbs entirely, so it s important to know when we re referring to something being (equaling something else) or existing. In this lesson we ll go over the differences between 이다, to be, and 아니다, to not be. We ll also cover 있다, to exist, as well as its opposite, 없다, to not exist. 이다 to be 아니다 to not be 이다 means to be, but you can also think of it as meaning to be equal to. If you wanted to say That is a cat, you would use 이다 because what you are really saying is That is equal to a cat. 그 것은 고양이예요. That is a cat. 저는 미국 사람이에요. I am an American. 저는 좋은 학생입니다. I am a good student. When using 이다, it attaches directly to the word it comes after, as you can see in the example sentences above. 3 Page 3 of 5 아닙니까? (more polite as a question) 아니에요 (polite) 아니야 (casual) Note that while 이다 has different conjugations depending on whether it follows a consonant or a vowel, 아니다 does not. 있다 to exist 없다 to not exist Just as 이다 and 아니다 are opposites, 있다 and 없다 are also opposites. Because 있다 means to exist, it is commonly used to mean to have, as in I have money. 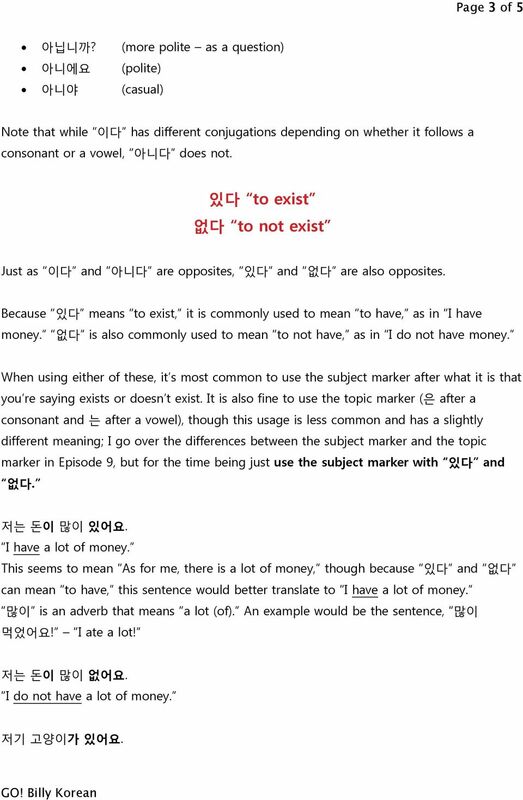 없다 is also commonly used to mean to not have, as in I do not have money. When using either of these, it s most common to use the subject marker after what it is that you re saying exists or doesn t exist. It is also fine to use the topic marker (은 after a consonant and 는 after a vowel), though this usage is less common and has a slightly different meaning; I go over the differences between the subject marker and the topic marker in Episode 9, but for the time being just use the subject marker with 있다 and 없다. 저는 돈이 많이 있어요. I have a lot of money. This seems to mean As for me, there is a lot of money, though because 있다 and 없다 can mean to have, this sentence would better translate to I have a lot of money. 많이 is an adverb that means a lot (of). An example would be the sentence, 많이 먹었어요! I ate a lot! 저는 돈이 많이 없어요. I do not have a lot of money. 저기 고양이가 있어요. 5 Page 5 of 5 other people and things is more of an advanced topic, and I ll go over it later in another lesson. Common conjugations for 있다 and 없다 있다 있습니다 (more polite as a statement) 있습니까? 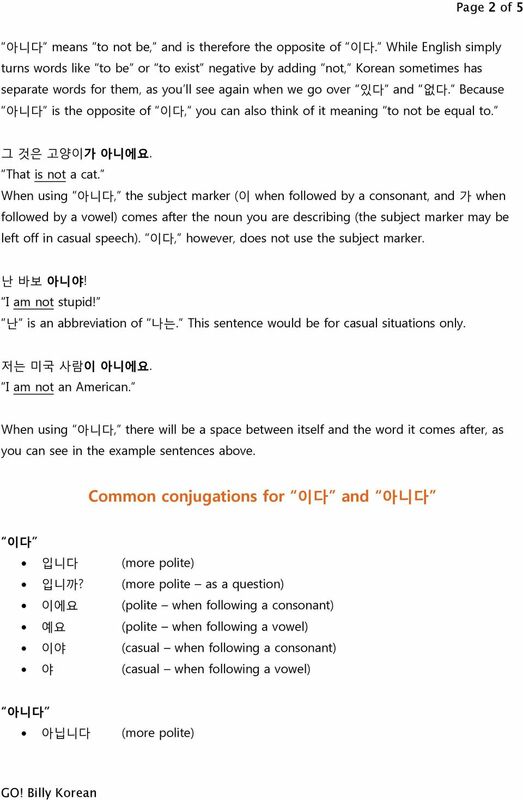 (more polite as a question) 있어요 (polite) 있어 (casual) 없다 없습니다 (more polite as a statement) 없습니까? (more polite as a question) 없어요 (polite) 없어 (casual) Well, that s all for this lesson. Practice by making your own sentences using what we ve gone over today. 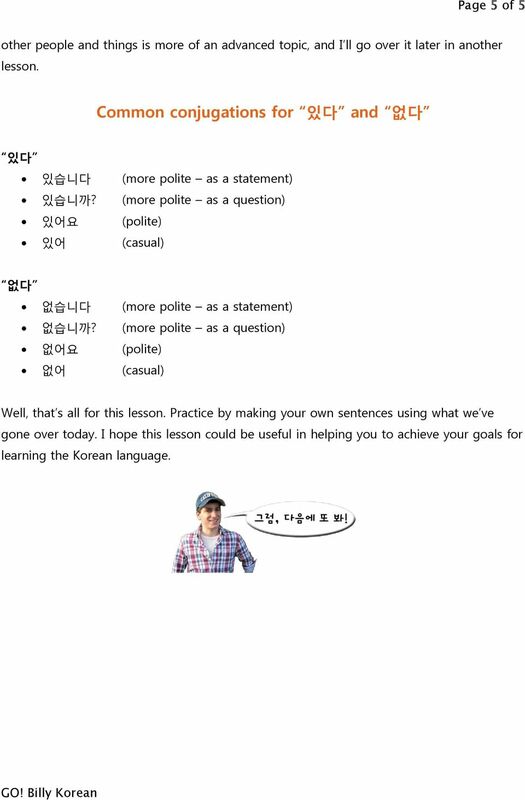 I hope this lesson could be useful in helping you to achieve your goals for learning the Korean language.